NOTICE: Your privacy is critically important to us. At The English Grammar Club, we have a few fundamental principles. To enable us at The English grammar club carry out our mission and goals effectively. 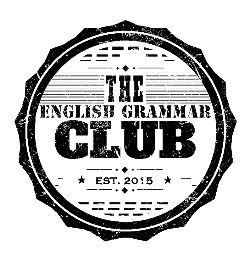 Certain visitors to The English Grammar Club websites may choose to interact with The English Grammar Club in ways that require The English Grammar Club to gather personally-identifying information. The amount or request and type of information that The English Grammar Club gathers depends on the nature of the interaction. For example, we ask visitors who sign up to http://www.grammar.zone to provide a username and email address. Those who engage in transactions with The English Grammar Club – by purchasing English language material, for example – are asked to provide additional information, including as necessary, the personal and financial information required to process those transactions. In each case, The English Grammar Club collects such information only in so far as is necessary or appropriate to fulfill the purpose of the visitor’s interaction with The English Crammar Club. The English Grammar Club does not disclose personally-identifying information other than as described above. And visitors can always refuse to supply personally-identifying information, with the caveat that it may prevent them from engaging in certain website-related activities. At The English grammar club, we specifically look into the upbringing of both adults and children… even less than 13. Contact us at info@theenglishverb.com and we will promptly remove you from ALL correspondence.